Google’s personalized homepage has a new interface inspired by Google+. Google is on a roll with unifying their online applications to bring them in line with the styling of Google+. The redesign follows in the footsteps to the changes recently made to Google Calendar and Gmail, and Google Docs and Sign-In. iGoogle (formerly known as Google Personalized Homepage), is a customizable Ajax-based startpage like Netvibes, Pageflakes, and My Yahoo!. Its features include the capability to add web feeds, Google Gadgets, and personalized themes. 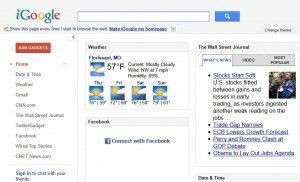 The new redesign brings yet another Google web application a Google+ style design. The button for adding gadgets has been made prominent and red. The menu’s for gadgets have been given a consistent feel across the board and are hidden until you mouse over it. One of the nicer features is the larger search box (that supports voice search if you use Chrome), and the ability to collapse/hide the sidebar. In what I would consider a bizarre design decision the advanced search page has been removed. The “I’m Feeling Lucky” button no longer displays in the list, however, as you type it displays in the auto-complete results. iGoogle makes for a great personalized homepage (start page), I personally use it because I’ve found it to be lightweight and fast. There are a ton of gadgets available to add to your iGoogle page to bring weather, news, Facebook updates, etc directly into your start page when you fire up your browser. Additionally, a mobile version is also available, providing you the ability to have the same start page when on your desktop, laptop, or mobile phone.